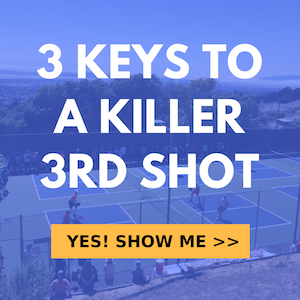 Do you struggle with your 3rd shot? If you do or if you’d simply like your 3rd shot to be better then this is the lesson for you. In this video we’ll cover the technique behind the forehand 3rd shot drop. We see many players with incorrect and/or extraneous movements when hitting there 3rd shot drop which leads to inconsistency. All though the 3rd shot is considered the most difficult shot in pickleball the technique is relatively simple and straightforward. It mostly mimics a basic dink. If you can master a dink then you can master the 3rd shot drop because it’s basically like hitting a dink from the baseline. Watch the video to get all the details on 3rd shot drop mechanics and/or read on. What you want to do when you’re getting ready to hit what you hope will be your third shot drop before the ball is even on your side of the net is you first want to be balanced in a ready position as your opponent is striking the ball. Feet spread a bit more than shoulder width and paddle in front and up a bit with relaxed arms but poised to respond. After you or your teammate serve, the return is going to come back to your side of the court, possibly deep in the court. And, from your balanced, athletic stance ready position with your knees bent and your back straight, you’ll probably want to be looking to take that 3rd shot with your forehand, even if it’s coming towards your backhand side. It’s very important to develop a rock solid 3rd shot drop on your forehand side because that is going to be your go to shot for being able to transition to the kitchen. Of course you’ll need to be able to hit it on your backhand side as well but the great majority will be taken by the forehand for most players because that is usually their stronger side. We’re going to cover the forehand 3rd shot stroke technique and footwork. LEt’s say the ball is coming really deep, as it often does, and it’s pushing you somewhat back in order to hit that 3rd shot. You will need to take a step back with your dominant and then step back in with your non dominant foot to give yourself the best chance of success on that 3rd shot drop. It’s very very hard to hit a good 3rd shot drop as you’re moving backwards. And, unfortunately, a well struck return that lands deep is designed to do just that. So you’ll want to take that step back quickly enough so that you’ll get far enough back in time to be able to step back in to the shot. Easier said than done and it will require practice, alertness and quickness on your part. By no means an easy task but certainly trainable and possible to do successfully and consistently. When you are able to step in to your shot that is what we call a shot executed with a closed stance. Whether the return pushes you back, comes right to you or requires you to move up to hit it, your best bet is to ALWAYS get into a closed stance in order to hit it. It’s much easier to hit a good 3rd shot drop if your legs and forward momentum are involved. If you’re just arming it most of the time, nows a good time to start working on that. You’ll definitely be more consistent and effective using your legs to control your 3rd shots. Once we have the legs squared away, it’s time to look more closely at the stroke itself as is executed with the arm. It’s it’s a low to high motion. And, you’ll want to make sure your paddle face is angled up. And you’ll see in the video, Jordan is just stiff arming the shot and hitting it only with the arm as we see many players doing. He uses his whole body to hit the shot. This is what separates intermediate players from advanced players. Advanced players get their whole body involved. The third shot is more of guided, pushing motion than it is a striking motion. Jordan’s arm is very relaxed with a slight bend in the elbow, a laid back yet stable wrist and a push motion that is mainly powered by the legs and movement is from the shoulder, not the wrist or elbow or forearm or any combination of those last three. The wrist, forearm and elbow should a remain relative quiet as your hitting the 3rd shot. He produces an L shape with is forearm and his paddle. The paddle is not pointed straight down to the ground. It’s very important that you get low as you hit the shot, so that you can move up and move forward to get in position for the ball and bend that back knee so that you can push that paddle face up into the ball which is what will produce that arc that allows the ball to clear the net with good margin yet still descend short on the other side into the kitchen. Your contact point will always be in front of your body. That’s where you have the most control hitting the shot. I also don’t want to hit it too close to my body or too far away and reaching for it because I’m going to also lose control on either of those positions. So you’ll always want to be in a spot that’s very comfortable. And if you get your feet right consistently and contact in the same spot then your consistency will go way up because you’re sweet spot which is ideal and most likely to lead to the best result. Better than if you’re in a pressed/stressed position of some kind. If you want do those things then you will get rock solid on your 3rd shot drop and be able to advance to the kitchen at will, even on deep returns.